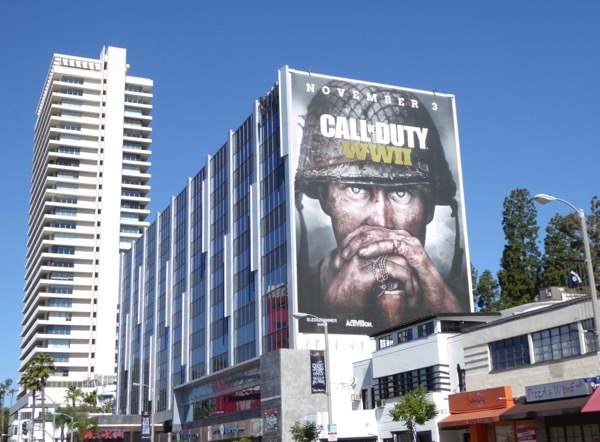 The skies of late have been filled with imagery of modern warfare for new TV shows like SEAL Team, The Brave and Valor, but the new Call of Duty game takes you back to World War II. 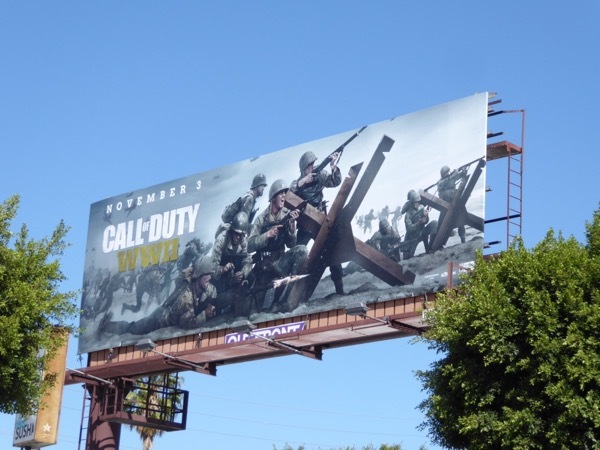 The action of this first-person shooter game takes place in the mid 1940s as the Allied Forces fight with the Nazi Germans (some of them zombies) in historical scenarios across Europe, like the D-Day Invasion of Normandy, Liberation of Paris and the Battle of the Bulge. 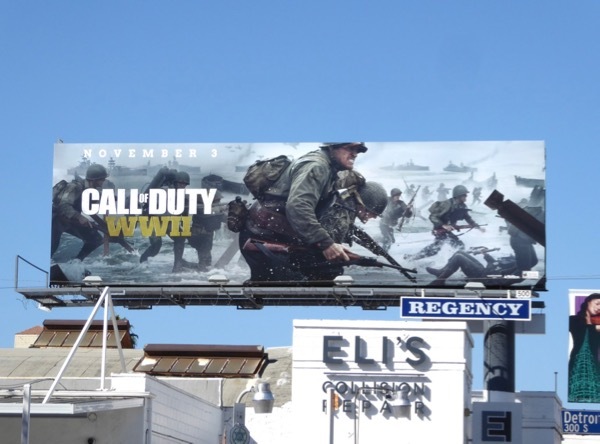 Hopefully this video game will remind players what it means to come together as a free world and fight against Nazis and Fascists who want destroy democracy, remove civil rights and ethnically cleanse those that are different from them. 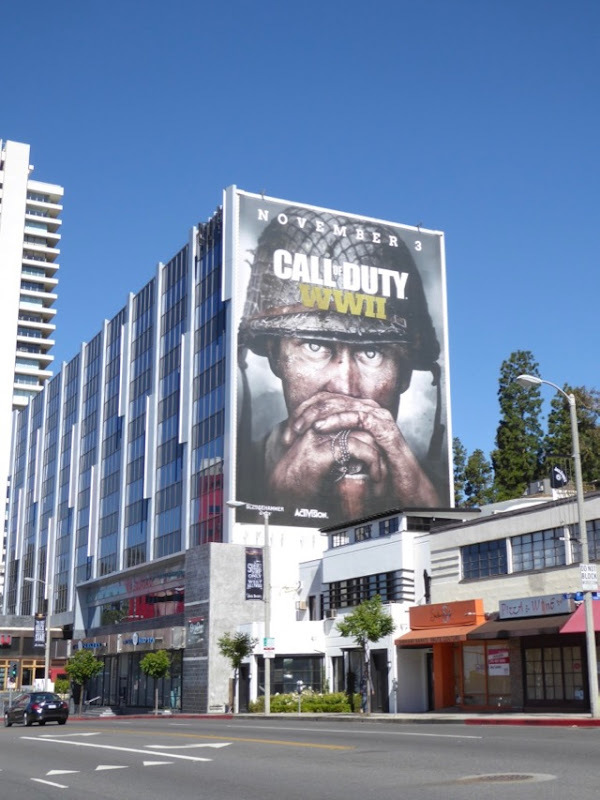 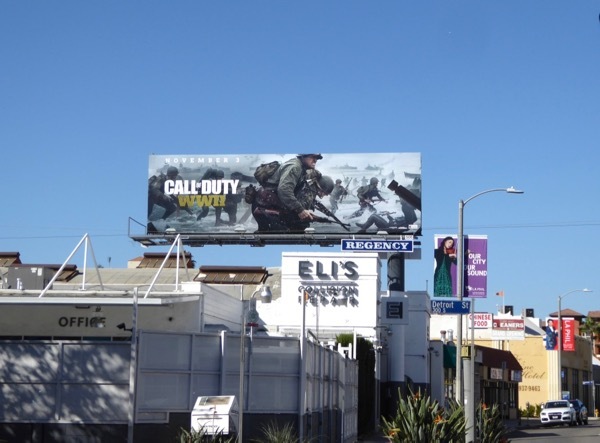 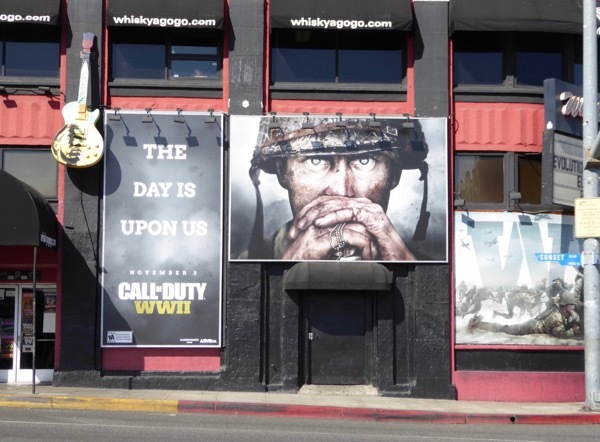 The giant-sized Call of Duty WWII billboard was first spied along West Hollywood's Sunset Strip on April 27, then it returned to the same ad location in October 2017. 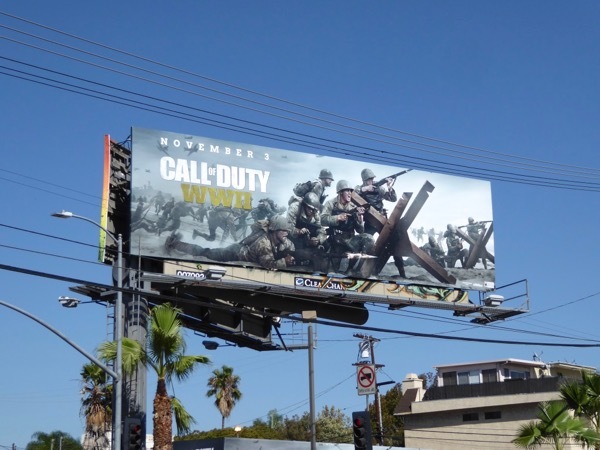 Meanwhile the other smaller and landscape billboards were snapped along 3rd Street, Sunset Boulevard, La Brea Avenue and Santa Monica Boulevard from October 18 to October 21, 2017. 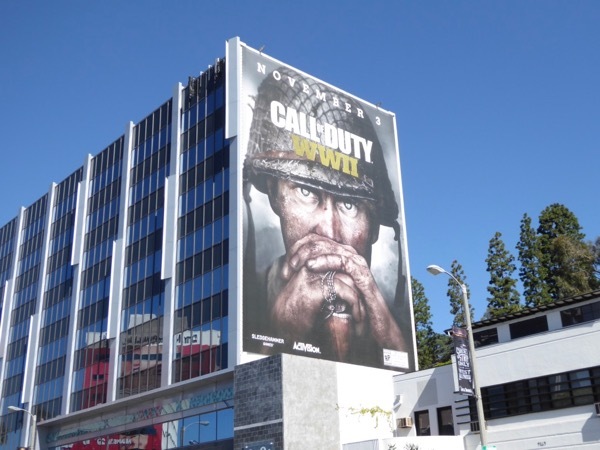 Fans of the video game franchise can also check out these other Call of Duty billboards filling the city skyline of L.A. and NYC in recent years. 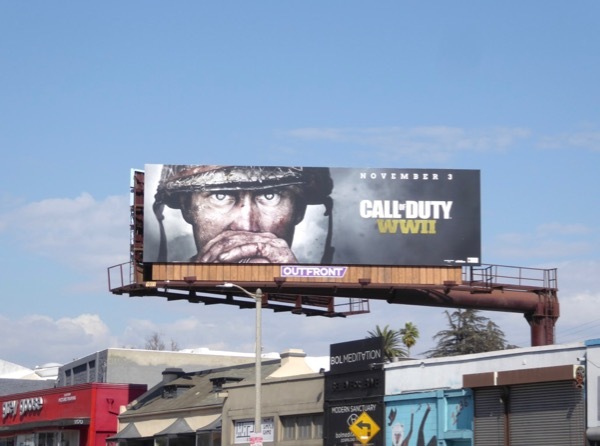 Plus for more World War II-themed outdoor ads, make sure you also take a look at these Fury movie billboards, these film billboards for The Monuments Men and these Dunkirk movie billboards. 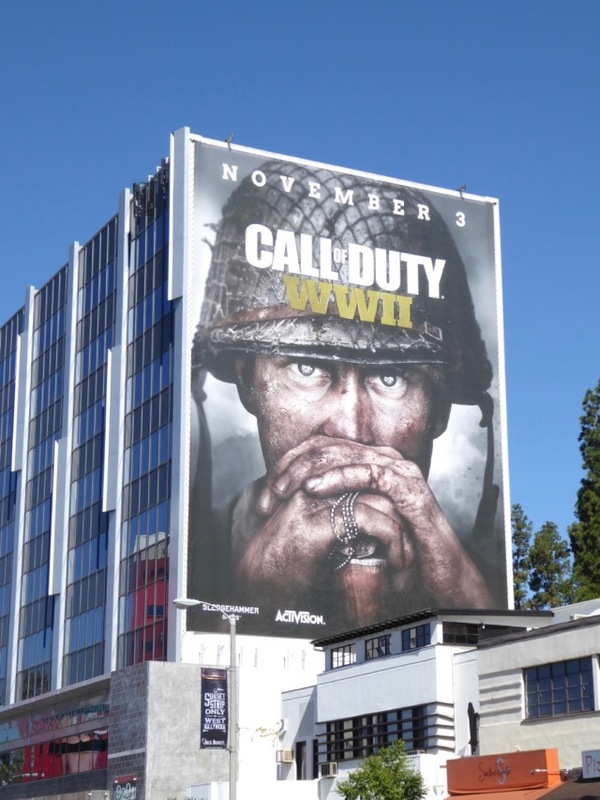 If you're a war game lover we know what you'll be doing this weekend, and let's hope that the actions of idiots in the White House today don't lead to there ever being the need for a video game for World War III.